Uncheck this setting to turn off Puro’s responsive layout. The site width will remain fixed on both desktop and mobile devices. Puro uses FitVids.js. FitVids dynamically re-sizes videos to fit the screen being used. The downside can be that videos stretch full width, beyond the size you’d like them displayed at. 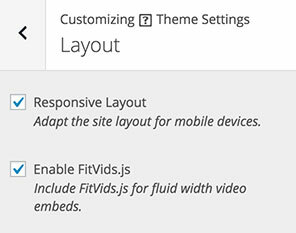 It’s possible to de-activate FitVids for a single video, to read more about that please see: https://purothemes.com/documentation/general-wordpress/deactivating-fitvids/. If you’d like to de-activate globally for your site, un-check this setting.